Welcome to the HallowThanksMas season…time to start shopping and eating and being grateful…. but not necessarily in that order. I did a bit of research to see what’s out there for those who like to play in the dirt. Here are some fun ideas for holiday gift giving, now or anytime in the near future. We always like a good pair of gardening gloves and I go back and forth about spending a lot of money for ones that might last a whole season or just a bag of cheap ones. The Holiday Gift Guide from Fine Gardening Magazine recommends “Foxgloves” which claim to be comfortable and durable and $21-36.00 per pair at Foxglovesinc.com. Then there are the claw finger garden gloves from Amazon by several different companies. These are usable for digging without tools…(” a set of tools in each hand”), are breathable and only $7.00 a pair. When it’s really mucky or chilly out, I wear my Bogs but I have been thinking of a pair of slip on boots such as “Sloggers” recommended by Julie and Melissa at Garden Goods. These are colorful and look like they would do the trick for around $45. Unfortunately, they were out of my size. Other brands I found online were Ariat, Ugg, Asgard, Dksuko, The Muck Boot Company and WTW. Succulents are still very popular, whether in a wreath, topiary or vase. Fine Gardening Gift Guide shows a ceramic succulent planter with multiple openings for various small plants. It’s distributed by exaco.com. 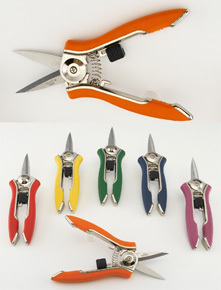 Melissa from Garden Goods suggested Dramm compact pruners and shears; good for deadheading and fine trimming. I like that idea of smaller tools since I sliced my finger open this summer in my deadheading frenzy. To go along with pruning is a collapsible garden bag to collect the cuttings. Other ideas from Garden Goods include wind chimes, window bird feeders, SPF hats, seed packs for stocking stuffers, and bulbs for winter color (amaryllis, paper whites). From the HGTV web site were gifts of a seed savers exchange membership (seedsavers.com), Fiskars garden bucket caddy, with room for tools and trimmings, the beautiful book, The Encyclopedia of Flowers by Makoto Azuma (amazon.com), and ready-made raised garden beds. These websites also have a wealth of ideas; Gardeners.com; uncommongoods.com; plowhearth.com; and hayneedle.com. Here are my suggestions to get you started on holiday shopping for the gardener in your life. Stihl pruners https://www.stihlusa.com/products/hand-tools/hand-pruners/pp30/ I don’t think Stihl is a common brand choice for the average gardener’s pruners, but I’ve had mine for 15 years, and they still get the job done easily. I confess that I am not great at taking care of my garden tools (Oil? What’s oil? ), but these babies have taken my neglect in stride. Goatskin gloves https://www.gardeners.com/buy/womens-bellingham-goatskin-work-gardening-gloves/8596120.html#start=81 I am definitely NOT a glove wearer. My hands get sweaty and I can’t feel the soil. But when I have a LOT of earth work to do, this is my go-to glove. I’ve had cloth, cow leather, rubber, hybrid, you name it, and these are by far my favorite. They are soft and thin enough to fit close to my hands without being clingy, allow me to feel what I’m doing, and seem to manage my bizarre hand perspiration well. Teaming with Microbes, by Jeff Lowenfels and Wayne Lewis http://www.timberpress.com/books/teaming_microbes/lowenfels/9781604691139 I can’t remember now where I first heard about this book, but if I had to guess I would say it was from Craig Shaaf of Golden Rule Farm in Kaleva. I haven’t yet purchased it, but it is on my list this year (Hint, hint. Husband, are you reading this…?) It is definitely anti-chemical soil additive, which isn’t for everyone. But I think any gardener can benefit from more information about how “to garden in a way that strengthens, rather than destroys, the soil food web—the complex world of soil-dwelling organisms whose interactions create a nurturing environment for plants”. Home made bee hotel https://www.canr.msu.edu/resources/building_and_managing_bee_hotels_for_wild_bees_e3337 For those with better crafting skills than I, this would be a great DIY gift. We all know that our beloved pollinators can use all the support they can get these days, and this project gives them a head start on setting up housekeeping. Baker Creek Catalog https://www.rareseeds.com/2019-whole-seed-catalog-pre-order-usa-canada-and-mexico-/ I will forever be an advocate of Baker Creek and their tireless work to preserve the historic foodstuffs of the world. Not only are their catalogs bursting with interesting, unusual, hard-to-find varieties of everything under the sun, they are beautiful to look at as well. This is the catalog that I get most excited about upon its arrival in my mailbox. Hori Hori knife https://www.barebonesliving.com/store/products/garden-tools/the-ultimate-tool I usually use my trusty trowel for transplanting, hacking at roots, and digging weeds, but I drool over these hori hori knives every time I see one. They just seem so useful, and this one in particular is so beautiful. A gardener can’t have too many tools, can she? Floret flower seed collection https://shop.floretflowers.com/collections/gift-collections A dear friend from high school introduced me to Floret a couple of years ago. I have always been more of a vegetable/herb gardener than ornamental/flower type of gal, but the Floret website and books have lured me to bumping up my flower growing game. Truly eye candy for any gardener. The stress of a hot, dry summer is showing on our garden and landscape plants and, while needed and welcome, recent heavy rains will not help the vegetables and perennials much. Further, we will be watching the slide into cooler and colder weather when the annual plants are exhausted and perennials are ready for a well deserved rest. Now is time for a best-practices refresher on garden clean up. -Remove any diseased or damaged plant material to the trash for disposal. Especially plants with powdery mildew. This plant material should NOT go into a compost pile. -Remove all other vegetable plant material to the compost pile. -Cover the bare soil with fall leaves, if you can. -Deadhead any plants with seeds that you do not want to spread. For example, Milkweeds and Asters disperse a lot of seed that may end up in unwanted places. These seeds can be composted, put into trash, or shared with friends if they are not invasive species. -Leave plant stems in place. There are two benefits: winter interest and housing for overwintering insects. -Now is the time to prune and reshape MOST trees and shrubs. Prune everything that blooms after the Fourth of July in fall. Remember, most spring blooming plants have already set buds for next year and pruning now can severely affect blossom abundance. They should be pruned in mid-summer. -Pruning generally stimulates plant growth so by pruning before the plant heads into dormancy actually encourages growth. -Prune away any dead stems, followed by shaping. Should a plant need a complete refreshing, remember that significant pruning should be accomplished over three years, removing a third of the over-growth each time. Opening up centers of shrubs can encourage fuller leafing and blooming by letting light in. -Finally, prune Oak Trees ONLY after and hard frost and before a thaw to reduce the chance of oak wilt. -Leave them in landscaped beds for a winter cover. -Mulch leaves in the lawn to add organic matter. -Collect the leaves to feed a compost pile. The most important task is to properly dispose of diseased plant material to reduce the spread the following season. Keep fall clean-up to a minimum for habitat preservation. This time of year is so satisfying when we reap the harvest of our labors, however it can sometimes be overwhelming. What to do when you can’t possibly eat every cucumber, zucchini, or tomato, and the neighbors are crying ‘uncle’? Preserve it! Home food preservation need not be intimidating, and doesn’t require too much of a financial investment, as the equipment needed is minimal and can easily be obtained, sometimes at flea markets and yard sales. Yes, there are more specialized tools that can make the process easier, but one can do without those when getting started. Foods with low acidity require more careful processing to ensure their safety when canning, but can be frozen and dried as well. The first thing that my mother made certain I had, even before I had my canning pot, was the ‘Blue Book’: Ball’s Blue Book of Preserving. Hers was well-loved, with dog eared and wrinkled pages, notes in the margins, total quantities of items ‘put up’ by year in the front and back covers, and slips of paper with with handwritten recipes tucked inside. There are multiple editions available, both new and used. This one book contains all the instruction one needs to get started, including the science behind food preservation, list of needed equipment, cautions and warnings, and many recipes. If you tend to learn better by watching something done, there are a number of YouTube videos available, also. I hope you will give home food preservation a try. Opening up a jar of home canned tomatoes or peaches in the dead of winter is like opening up a jar of summer. It will give your spirits a lift on the dreariest of days. On a Tuesday evening, a nice sized group met at the DeYoung Nature area off E. Cherry Bend Rd to walk along with Levi Meeuwenberg (subbing for Jonathon Alyward), on the Edible Trail. The trail was a project started in 2014 to create an edible forest which would blend in with the community, TART Trail and other nature related organizations. The TART group gave permission to use a portion of land alongside the trail and the Land Conservancy pitched in as well. Money was raised and once the planting areas chosen, volunteers used the lasagna or sheet mulching method to install the selected native plants. Currants, Nanking Cherry, French Sorrel, rhubarb, and others have survived in this short but interesting path. Some goals of this and other edible forests are to build soil, increase biodiversity, and improve insect and wildlife habitats. With our dry hot summer, the trail was looking a little needy and Levi suggested a visit, any time, to pull some weeds and trim here and there. MG trainee, Chris Heyman, volunteered to be the point person from MG’s and to help make this a Master Gardener project so that volunteers can earn volunteers hours woking on the Edible Trail project. Thanks for the walk on such a beautiful evening, Levi! Garden walks offer several important benefits to attendees and the community. For many Garden Clubs a Garden Walk represents a significant amount of their funding each year. Most, if not all, of the Garden Walk proceeds are returned to the community through public beautification at public parks, Libraries, schools, and more. Some Garden Clubs provide grants for special garden projects. For attendees it is an opportunity to see how other gardeners view gardening for beautification, food production, outside living, and more. Many attendees come away inspired with fresh ideas for their own yard. If nothing else, ticket holders spend a few hours in the garden stopping to smell the roses.